International Market Selection - The "Crosswalk Index"
After making the commitment to take your business global, one of the first steps (and one which you should be consistently evaluating and revisiting) is international marketing selection. Prioritize where you are going and why. Hint!! The biggest markets aren't necessarily the best place to start, or even to expend resources at all. Normally international market selection is based on extensive research of trends in demographics, consumer income, GDP, etc. Cultural and customer habits are important as are business investment expectations. But after a complete matrix is established based on a number of variables (download our free eBook on international market selection) you need to make decisions which account for your intuition as well. International sales development can be largely distilled to a science, but the important difference between success and "blah" is often the experience and art. Art? Experience? After a while you can quickly intuit certain market fundamentals from even a relatively brief exposure. This doesn't mean you are culturally astute in that specific market, nor is it infallible, but our "crosswalk index" is an example of how extensive international business development experience can help you make better strategic decisions. And frankly, why an international business consultant may be worth considering. The following article was written by Ed Marsh and first published on InternationalMan.com. It usually starts as a tug on the sleeve, or a gentle touch on the elbow. And it's almost always ignored, because it feels similar to the common plaintive touch of a child seeking some change. Unheeded, the tug is quickly followed by a more urgent "Wait!" as you step from the curb and the traffic goes zipping by inches from your toes. And you suddenly remember you're "not in Kansas anymore." That "reality check" moment is another data point supporting my carefully researched international business barometer - the "crosswalk index of foreign markets." OK - maybe it's not "carefully" researched, but this guideline has proven remarkably and consistently valid across global markets. Traffic and pedestrian behavior, and particularly the interaction between the two, offer two international business insights that are invariably valid. In every market they will be different and distinct. And therefore, fundamentally, they serve first to provide an important glimpse into a market's "mentality," and second as a consistent, gentle nudge to remember you're out of your natural zone, no matter how comfortable you become. Sounds simple, but here's why it's important. Our birth and upbringing "hardwire" certain fundamental perspectives into our subconscious. This hardwiring impacts our fundamental outlook and reactions. I discovered this after years of marriage to a foreign national, when I found remarkably consistent similarities between my perspectives and those of the business people from her country of birth. It's very hard to get people to articulate those hardwired attributes - because by their nature they aren't even consciously aware of them. But if you want to successfully do business in a country, you have to develop an understanding of the basic assumptions. The good news is that to a large extent they can be discovered through observation - of crosswalks. Mumbai - indescribable chaos (and I'm a Boston driver!). Horns honking, lanes ignored, signals largely ignored, grid-lock paralyzing progress, traffic cops routinely paid off with Rs 100, and, naturally, a left side orientation. Pedestrians cross at their own peril, weaving between cars, perhaps using a wandering cow (which is treated far more deferentially than a pedestrian) as a shield against the Ambassadors, rickshaws and Scorpios. Munich - complete orderliness, right down to the yellow light warning, not only to slow prior to red, but also to prepare prior to green. At 2 am when there is no traffic on the street, you had better wait for the green walking-man signal lest a carefully maintained Mercedes or BMW come careening along. 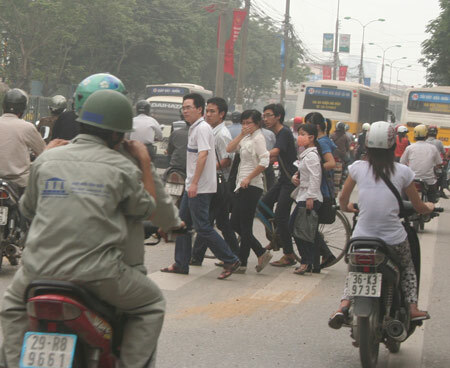 Saigon (HCMC) - 16 million motorbikes in a city of 20 million people. Signals are obeyed, but the flow is incessant. Crossing the street here requires a steady pace and a strong nerve. Move consistently, and the flow will divert around you without disruption - but react unpredictably and you court disaster! Tokyo - conservative in demeanor and vehicle, and meticulous about the "rules of the road." Go with the flow and you will be fine. If you are familiar with prevalent business practices and attitudes in these markets, you'll immediately see the precise parallels. The crosswalk index nails the business culture! When you travel enough (read, too much! ), you find that international hotels and airports start to blur. Sure, street signs are different, and menus may list unfamiliar foods, but it is easy to forget that one is actually doing business in a different environment. As comfort and routine take hold, awareness decreases... and trouble starts. Most international business disputes which are attributed to "cultural differences" are actually founded in those differences of which there is little awareness. In other words, when you are aware of a cultural difference, you can work around it - but if you are unaware, it will ambush you. And recovery is difficult. Just as foreign reverse-flow traffic patterns and disregard of signals confuse our innate sense of routine, their business analogs (e.g., attitudes regarding timeliness and sanctity of verbal contracts) can similarly catch us unawares. An adrenaline jolt from a near miss is the perfect periodic inoculation against the insidious lightheartedness that ensnares even experienced international business people. Need to quickly assimilate into a new business culture? Guide books and cultural training are great - but you're absorbing someone else's predilections and biases. On the ground experience is helpful, but you need to function effectively from the get-go. Just go find the nearest intersection, and absorb 70% of what you need to know! Wondering whether this sort of expertise could benefit your global sales initiative? Contact Consilium today to chat.